A relationship has existed between the University of Cape Towns Medical Faculty (MF) and Groote Schuur Hospital (GSH) since the MF was established in 1912. However, this was not formalised until the first Joint Staff Agreement was signed in 1951. This close and rewarding association achieved outstanding results and produced significant benefits for both institutions over many years, despite intermittent problems and disputes. More recently, difficulties have been experienced, but it is hoped that these will be overcome. The relationship between the Cape Provincial Administration (CPA) and UCT's MF was formalised following abolition of the CHB in 1950 and signing of the first Joint Staff Agreement in 1951. This was amended in 1966 to ensure that university staff, mainly the professors, were employed and paid 51% of their salaries by UCT, with 49% paid by GSH; virtually all other staff were employed and paid by GSH. Clause 18 of the Joint Agreement provided for hospital staff to travel overseas to attend conferences or for study, for overseas specialists to spend paid time at GSH and the MF, and for joint pathology services. Various joint committees were established. Although the Joint Agreements specified that GSH would be responsible for patient care and UCT for teaching and research, this was liberally interpreted and generously subsidised by the CPA and GSH, as was the use of hospital laboratory resources for research. This enabling environment facilitated innovation and the introduction of new technology and international advances in medicine, but significantly increased hospital expenditure. By establishing 'Control Committees', hospital management sought to control rising costs and ever-increasing patient numbers by setting priorities and introducing rationing - but with little success. Both parties to the Joint Agreement also strongly supported the provision of extensive community outreach services, e.g. Midwife Obstetric Units, the Peninsula Maternal and Neonatal Service and the Continuing Perinatal Education Programme (COPE) (provided throughout the Cape Province by the Obstetrics and Paediatric Departments); psychiatric, genetic and otorhinolaryngology community services; and developing ancillary radiotherapy units in the Eastern Cape. These other outreach programmes and the provision of primary, secondary and tertiary level health services confirmed the belief of the Cape Province's population, and further afield, that GSH was indeed the 'people's hospital'. The Teaching Hospitals Board (THB) and GSH benefited from the resulting generous bequests and donations. Planning of the new hospital in the 1970s and early 1980s was greatly facilitated by the MF deans, most notably Professor George Dall, all Heads of Departments and UCT's previous registrar, Mr Len Read. UCT and the MF co-operatively agreed to use space vacated in the old hospital to house the academic clinical departments instead of building the proposed 'Link Building' additions to the Medical School. 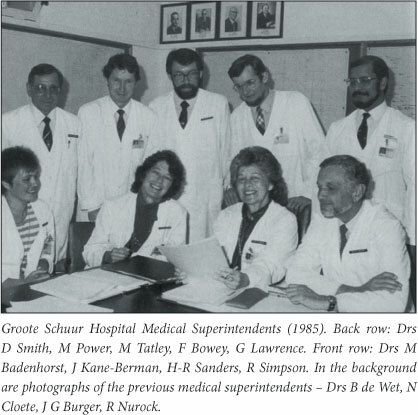 The Joint Agreement enabled a relationship which was generally harmonious, collegial and productive, ensured high-quality patient care and research and produced one-third of registrars, one-third of junior doctors and one-tenth of nurses for South Africa from 1938 to 2008.2 Committees such as the Teaching Hospitals Central Advisory Committee and the Faculty Board, on which members of both the MF and GSH management served, ensured good collaboration and generally wise decisions. 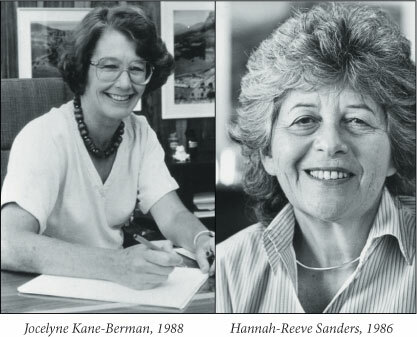 During 1956 - 1957 and 1963 - 1995 the authors were employed by GSH as medical superintendents on the joint staff. The most difficult issues arose from the apartheid policies and actions of the government, UCT's liberal ethos conflicting with segregation laws enforced by the CPA and which the medical superintendents were pressurised to apply. In practice, the medical superintendents, who found themselves 'the ham in the sandwich' between the authorities and the Faculty, either turned a blind eye to the increasing integration of wards and clinics during the 1970s and 1980s, or actively supported the MF's efforts to integrate all services in the interests of better patient care and staff morale. Theatres, radiology and radiotherapy services had always served all ethnic groups. Complete racial integration was achieved soon after patients were moved into the new hospital - notably, several years before other hospitals followed suit. Undoubtedly the reputation of GSH was enhanced by the outstanding research output and clinical expertise of the Joint Staff and in particular by the first heart transplant in 1967. The name of GSH became renowned internationally, attracting outstanding academics to its doorstep, international conferences to Cape Town, invitations to the MF staff to speak at overseas conferences, increased funding, new buildings and, perhaps regrettably, staff lost to overseas. Of particular importance, there evolved a patient-centred and co-operative working environment where unique interdisciplinary liaisons, high ethical standards and passion for the institution and its work pervaded. The rich academic environment encouraged many other professional, nursing, administrative, technical, and general staff to further their education, with obvious benefits to GSH. The medical superintendents benefited from their Joint Staff appointments through teaching and travel opportunities, further study and the introduction of innovative management practices and training of community health registrars. This environment was not paradise, however - conflict and acrimony occasionally arose but the relationship between hospital and Faculty, characterised by common goals, values and ideals, ensured that GSH remained true to its motto 'Servamus' - we serve. Many things have changed since the authors left GSH, but we hope that this remarkable relationship will overcome current and future obstacles and will endure and strengthen. We wholeheartedly congratulate the Faculty of Health Sciences on its centenary and wish it continued success in the years ahead.